We ran the numbers on every ICO we featured in 2017 – at least the 11 that are now tradeable on exchanges. 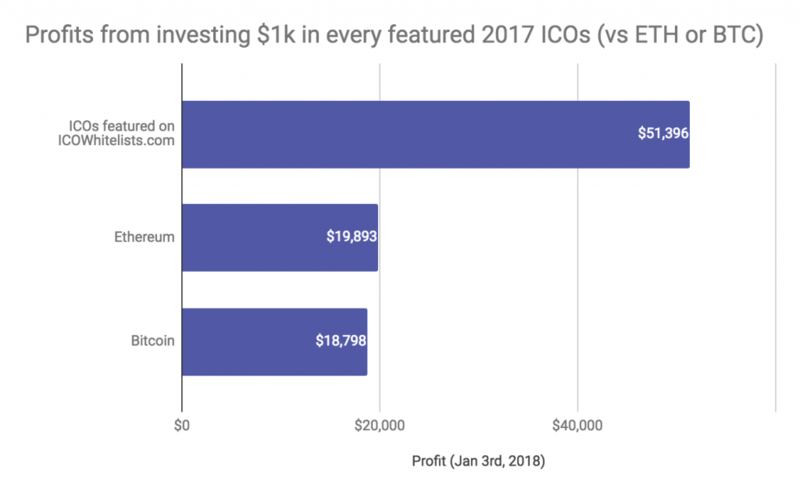 By doing this we could measure exactly how much you would have profited from investing in the ICOs we featured in 2017, based on their value today (Jan 3rd, 2018). The average return on all ICOs featured in 2017 is 5.7X. That means a total investment of $1,000 would now be worth $5,700 ($4,700 profit). If you invested $1,000 in every ICOs we featured in 2017, you now have $51,396 in profits (… assuming HODL!). Your total portfolio would be worth $62,396. If you had instead only invested in ethereum or bitcoin at the time of the ICOs, you’d have a 2.7X return for ETH and 2.8X for BTC. Your profits would then “only” be $19,893 (ETH) and $18,798 (BTC). In other words, our featured ICOs gave a 2.6-2.7X higher profit than investing in ETH and BTC. One thing we found interesting, as you’ll see in the table below, is that the best performing ICO on our list, was a relatively low-profile one: Snovio, which had a 12X return. On the other end of the spectrum we find Airswap, which had the lowest ROI, despite receiving a lot of media attention. Snovio and Airswap illustrate two important points: 1) media attention and hype is not everything in ICO investing, and 2) relatively unknown ICOs can sometimes yield very high ROI. Going forward, we naturally cannot make any promises for the performance of any ICOs featured. As always, none of the information provided at ICO Whitelists should be taken as investment advice. Always do your own research, and conduct proper due diligence before investing in ICOs. This is a space with very high risk, so you should never invest more money than what you can afford to lose. 2018 will certainly be an exciting year for crypto, and we aim to continue to provide you with top-quality content and data on ICOs. Below is the full table of the 2017 ICOs for your reference. Please note the numbers might have changed since writing this article on January 3rd, 2018. Thanks for the comment, Bello! A $100 investment per ICO would have given you a $5,139 profit. $10 would have given $513 profit, etc. So your investment didn’t necessarily have to be $1k per ICO. Of course, there are no guarantees going forward – this was just a review of 2017. This is essentially true undervalued projects like SNOVIO and Airswap can yield better return then the know hyped ones. I have been looking for such low marketcap gems only. Great Analysis. That chart is just wrong.. If you invested 1000$ in bitcoin you would have 19.000$ profit, 1000$ in ethereum 18.000$ profit and so on. Sorry Hest, we probably didn’t explain it well enough, but it’s not wrong. We’re not comparing the 11 x $1000 investments with a single $1000 investment in ETH or BTC. We’re comparing the ICO investments with 11 x $1000 into ETH or BTH at the same time as the ICOs started. This is the only fair way of doing it, since it requires the exact same capital at the same time. In all cases you invest a total of $11.000. Thanks for raising this though – you’re probably not the only one who misunderstood this. Clearer now? What about US investors who are having trouble interesting in ICOs due to KYC verifications? What do you recommend? Unfortunately we can’t make any recommendations on legal matters. Sorry about that! We featured 14 ICOs in 2017; 3 of them were not yet tradeable at the time of writing the article: Zilliqa, Crypto20, and CoinFi. How do i get the 2018 ICOS on your website? Don’t see UTRUST in here and that hit a 15X at one stage (think it’s hovering @ 13X as I type this…….